It is unusual for villages with such well-documented histories not to have an old church used for worship over the centuries. Although the King’s Commissioners visited the Sibfords in 1547 and reported "an ancient church which has fallen into decay", no site or remains have been found. 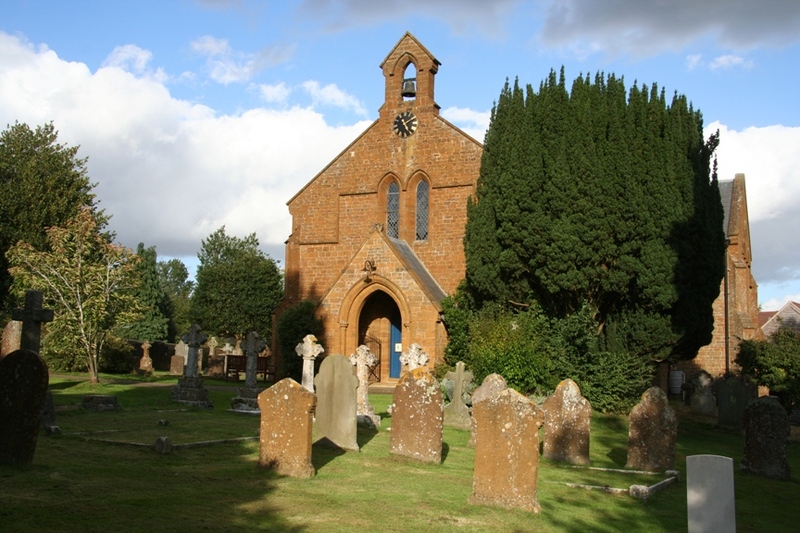 Until 1840 and the consecration of the existing "new" church, the Sibfords were part of the ecclesiastical parish of Swalcliffe (1.5 miles east of Sibford) and services, including burial, took place there. Holy Trinity is unusual among the churches of north Oxfordshire in that it does not have a tower. The church was erected by grant and public subscription to provide 500 seatings, 340 of which were free forever. The design was by H J Underwood of Oxford, and the land was donated by Rev William Wilkes in 1839. 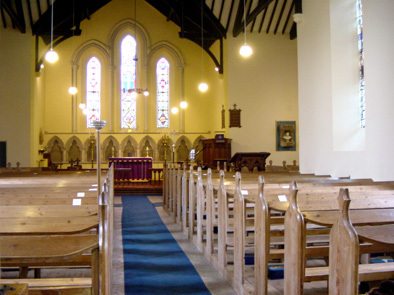 It has a spacious feel under its roof, restored in 2000, but has no separate chancel. It has some excellent examples of Victorian and Edwardian stained windows, fine pews and choir stalls made by Lewis Poulton (grandfather of the Lewis Poulton who represented the Sibfords on the old Banbury Rural District Council for so many years). 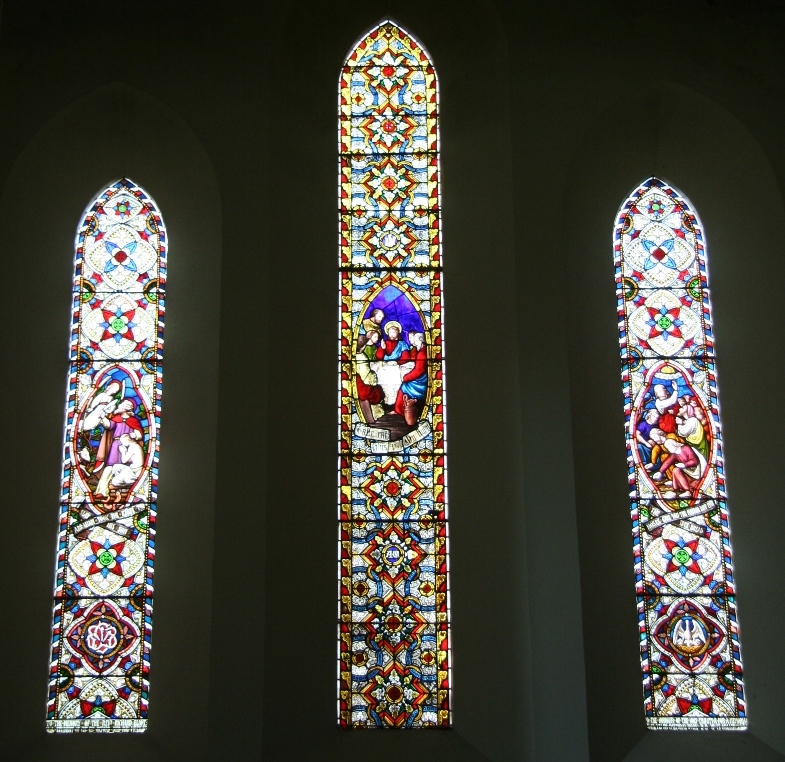 The more modern window in the south wall was erected in memory of Flying Officer Hugh Oddie, who gave his life in Holland during the Second World War in 1943. 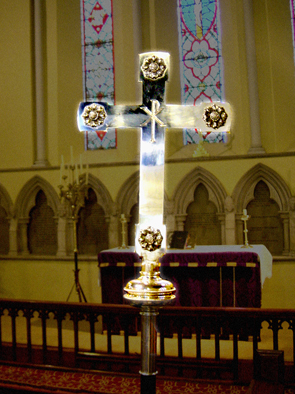 He was the grandson of the headmaster at Sibford School, his family lived in Sibford Gower and his mother designed the window and donated the silver processional cross to be found at the right hand side of the chancel. 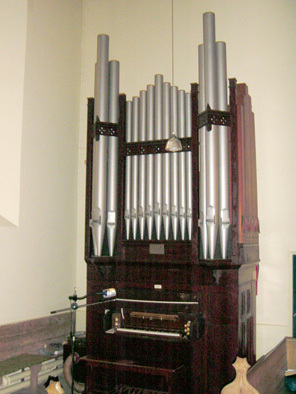 The single manual organ was also erected by public subscription in 1906. Made by Jacksons of Oxford it was dedicated by the Bishop of Oxford. Other artistic treasures include the tall wooden Paschal (Easter) candleholder that was made by Ted Webb (1916–1985) a farmer who moved to Sibford Gower when he retired. The sturdy five-pillared wooden lectern was also provided by public subscription. 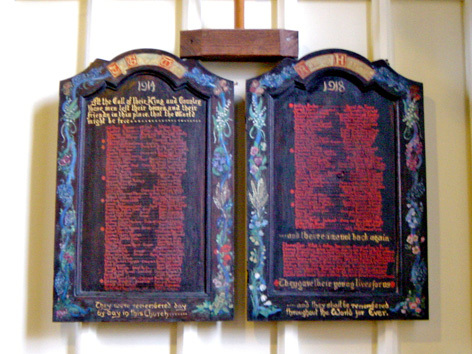 The Ten Commandments are inscribed on the reredos behind the altar table. It has been suggested that some of the stone masks behind the screen look much older than 1840 – could they have been salvaged from the fabric of the much older church or chapel? 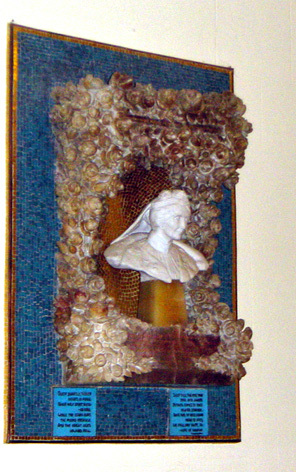 On the right of the altar on the east wall is a charming mosaic memorial with a sculptured bust to Isabella, the mother of Frank Lascelles. He was the son of Rev. Edward Stevens (Vicar of Sibford 1874-1898) and a very talented artist, sculptor, writer and Pageant Master to Queen Victoria. Living at the Manor House in the village he was a striking figure and entertained many famous guests including the composer and lyricist Ivor Novello. 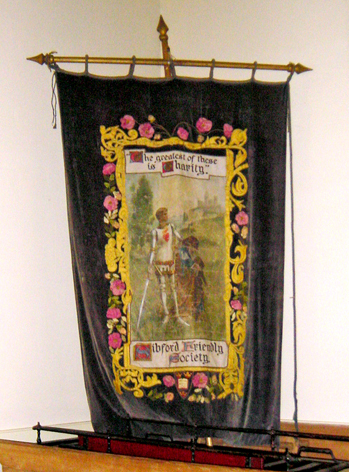 Here also, resting in the corner is the Sibford Friendly Society banner, designed by Frank Lascelles, bearing a picture of a St. George style knight. 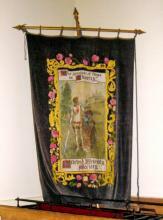 This was paraded at the head of the procession on Sibford Club Day, which used to be held annually on the first Monday in June. On the right hand side of the north wall that encloses the kitchen area, the inscribed wooden memorial doors record 88 men and two women who served in the 1914-18 war. Ten never returned to Sibford, having given their lives serving in France, Bavaria and Egypt. 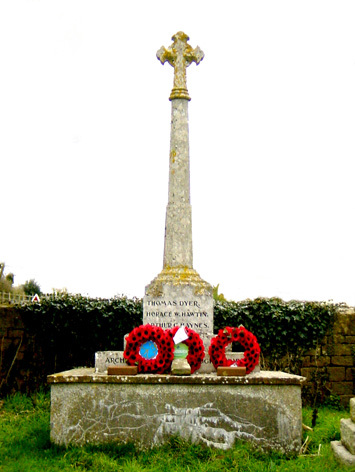 Those who served in the Second World War are recorded on the War Memorial by the gate in the churchyard. 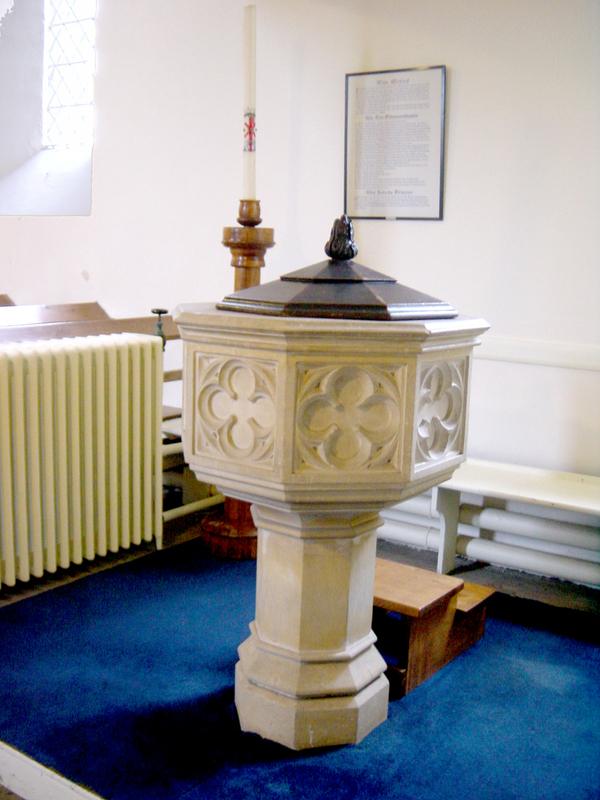 Baptisms are carried out in the font, also at the west end of the church. 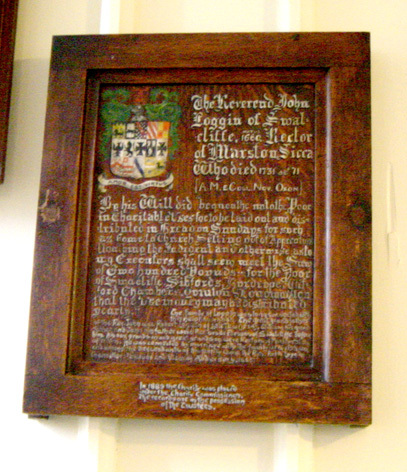 Most churches record gifts and there is a wooden illuminated memorial on the west wall (south side) by the church door to the Rev John Loggin (1660 - 1731) of Swalcliffe, and also Rector of Marston Sicca, who left £200 for bread for the poor of the Sibfords, Burdrop and Swalcliffe providing that they attended church on Sundays. The amount was passed to the Charity Commissioners in 1899 and disbursements are still made annually from this charity. The porch was added in 1879 in memory of Elizabeth Dix who lived in Swalcliffe. Her sister lived in Malvern House in Sibford Ferris and played the organ in the church. 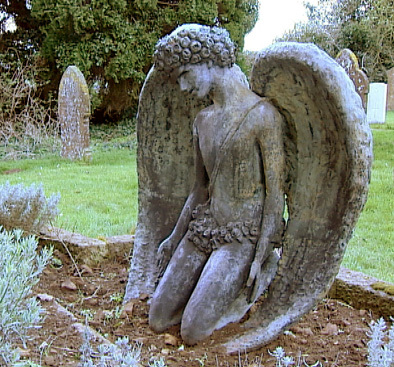 Just outside the church near the west door is a bronze kneeling angel, also designed by Frank Lascelles, keeping watch over the family grave. It was stolen in 2000 while the church roof was being repaired. After being exhibited on the television Crimewatch programme, it was recovered from Hayling Island, returned and securely fixed in its rightful place.